The desk in the laundry room was missing some handles. They weren't standard size, and I liked the existing ones, so I wanted an inexpensive alternative. I remembered something Wendy @ the Shabby Nest had done, and it turned out to be the perfect solution! 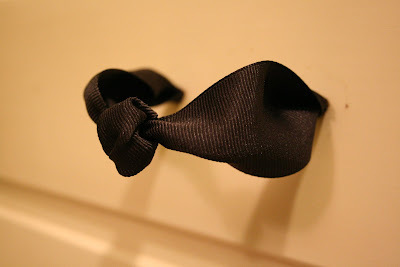 I just took some black grosgrain ribbon I had, tied a knot in the middle, then threaded both ends in to the holes, tied a knot behind both to hold it in, and that was it! 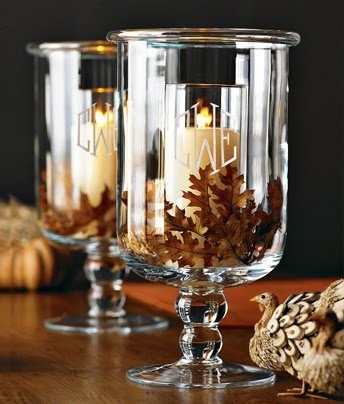 Have a great weekend~it's finally getting cooler here and I think I'm ready to pull out autumn decor! Ooooo--"juxtaposition." Fancy schmancy! ;) Love the ribbon. Honestly, that is adorable and I wouldn't have thought of it in a million years. But Im so glad I came. I ahve an old piece with no handle...and you got me thinking! That looks great! And "juxtaposition"--what fun to work that in! Hey lady! 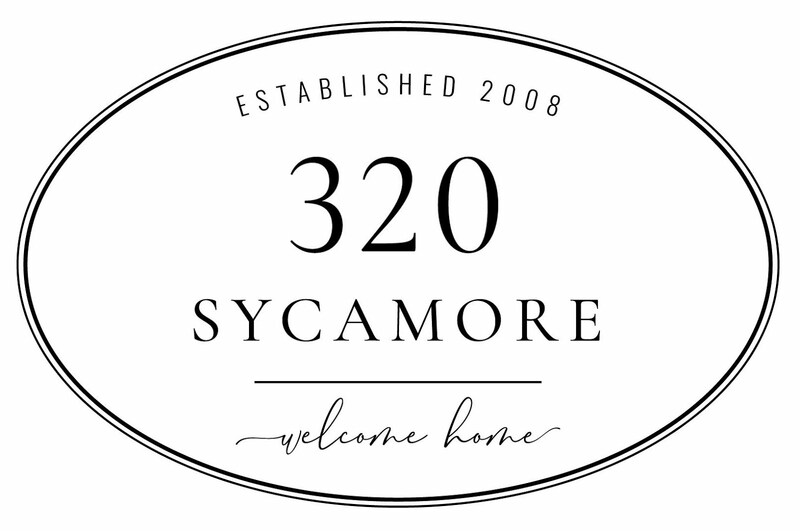 Glad to provide an answer to a decorating dilemma...and thanks for the shout out! You rock! Cute! I've seen rope used that way... for a "nautical" look... but not ribbon. Very clever. I love it! I'm going to have to do that on my daughter's dresser. She would love it. Thanks for sharing! Very cool idea. Hardware can be so expensive. Thanks for sharing! I used bandanas on my boy's night stands awhile back. Love the look of the ribbon too! 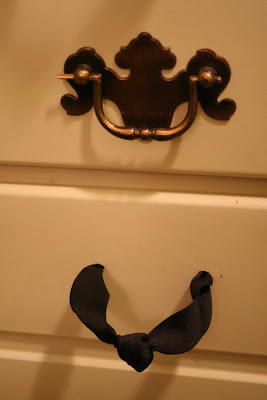 great solution, love the ribbon. What a great idea! The possibilities are endless. I forgot all about this and am so glad you posted it! 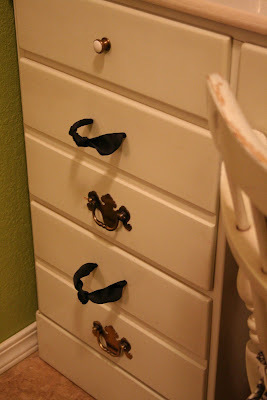 I am in need of handles for a cabinet in the playroom and they are also a strange size so this will be perfect! Never would have come up with that idea on my own ~ you are clever! What a great idea! Thanks for sharing ~ it looks good. That is an fab idea! So easy too, & it looks great. I forget how many things ribbon can fix. Loves it! What a clever idea! Love it an so cute! Clever!!! Cool idea.. You could also run a jumbo bead though the middle of the ribbon if you wanted extra "pull" though the middle of the ribbon.